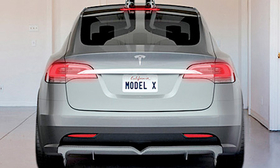 The Model X, a seven-seat crossover, is to go on sale in fall of 2014. It's all about resources in Tesla Motors' product development department. Tesla CEO Elon Musk has big plans for rolling out more electric vehicle nameplates to supplement the Model S sedan, but the lean engineering and design staff may have trouble meeting his timetable. Model S: Job 1 for the flagship sedan rolled out in summer 2012, but Musk has said that if there are advances in technology, things could change rapidly -- such as quick-change batteries coming by year end. He sees the platform lasting six years. Model X: Production of the Model S-based seven-seat crossover begins in the fall of 2014. Although doubters wonder if the "falcon-wing" doors will pass crash tests, Musk insists the feature will make it into the final edition. Another first for an EV: A dual-motor all-wheel-drive system. Musk predicts the crossover will go from 0 to 60 mph in five seconds. Gen III sedan: An EV the size of a BMW 3 series, with a real-world 200-mile range and a price around $35,000, is planned to put Tesla over the mass-market hump when it arrives in late 2016. Gen III crossover: The crossover, scheduled to arrive in the spring of 2018, will share underpinnings with the Gen III sedan. It targets the BMW X3 and Audi Q5 and may share the Model X's falcon-wing rear doors. Sports car/roadster: Musk promises Tesla once again will build a sports car and roadster. But given the importance of the Gen III timetable, those cars are at least six years away, said a Tesla insider.